I bought my first AccuCycle Elite in 2004 and I chose it over other models because it had two independently-programmable outputs. Dual output chargers are old-hat today, but it was novel technology back then and I really liked the idea that I could charge a LiPo pack for a plane and the NiMH pack in my transmitter at the same time with the same charger. 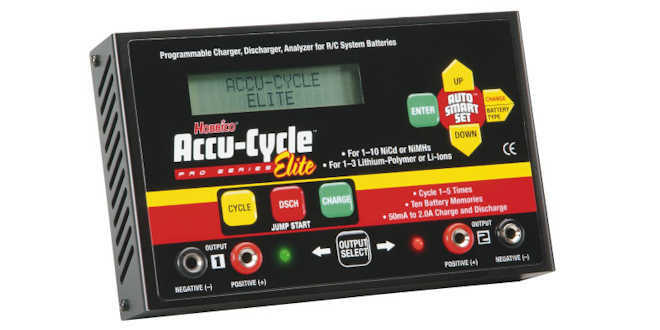 But I quickly discovered another more important advantage to the AccuCycle Elite: It has a unique ability to charge NiMH packs at low -deltaV sensitivity settings without suffering the false peaks that plague other popular chargers. In a nutshell, a low -deltaV sensitivity setting means a low pack temperature at the end of a charge cycle and low temperatures mean longer pack life. That was particularly important to me because my favorite RC discipline involved building and flying slope planes made of EPP foam covered by layers of strapping tape and iron-on film. It’s a common practice when building that kind of plane to bury a NiMH receiver pack in the nose to help make CG without adding a bunch of parasitic weight, and those embedded packs are charged in-plane through a charging jack. A disadvantage of that kind of construction is you have to cut a plane open if you need to replace the RX pack, and packs can go bad pretty quickly if they get hot when you charged them. To compound the problem, foam is essentially insulation, so any heat that is generated during a charge cycle is trapped. I had to cut open a couple of my planes after the packs died and that inspired me to study the science of charging NiMH cells with the goal of coming up with a charging method that wouldn’t ruin them. One answer is to trickle charge them at 0.1C, but that can take 10 hours or more per plane if the packs are discharged when you start. A faster solution is to use a peak-detect charger set to a 0.3 to 0.4C charge rate and 4mV -deltaV (peak detect) sensitivity setting, but many chargers either don’t have adjustable -deltaV settings or you can’t set ’em that low. Some charger manufacturers deliberately do that because low -deltaV settings can result in premature (false) peak detection which results in incomplete charge cycles, unhappy customers, and warranty returns. The AccuCycle Elite doesn’t suffer from those problems, though. Its -deltaV sensitivity can be set as low as 3mV and it doesn’t suffer from false peak detection. I don’t actually understand how their NiMH charging algorithm differs from other chargers, but the Hobbico engineers got it right. That’s why I think the AccuCycle Elite is still one of the best chargers you can buy for charging NiMH packs: It works extremely well at low charge rates and -deltaV settings and that’s a claim few if any modern chargers can make. I’ve also used high-end chargers from AstroFlight, Great Planes, Hitec, Hyperion, iCharger, Schultz, and Sirius to charge NiMH packs and none of them worked as well as the the AccuCycle Elite. I have two of them now and they’re the only chargers I use to charge and maintain my NiMH packs. I typically set my AccuCycle Elites to 0.3 or 0.4C charge rate and 4mV -deltaV sensitivity when I’m charging embedded NiMH packs. If I need to hurry I’ll kick up the charge rate to 0.5C and drop the -deltaV sensitivity to 3mV and I still reach full charge without heating up the pack enough to concern me. I should add that the -deltaV sensitivity setting is listed as “Peak Sensitivity” in the AccuCycle Elite’s menu system.